My 2009 article on pumpkin beers laid out the case for pumpkin beers as an excellent accompaniment to a fine cigar as the leaves change and the weather turns crisp. Shipyard Pumpkinhead: This Maine brew is actually a “malt beverage with pumpkin spice added” according to the label, but don’t let that fool you. The copper-colored beverage has the aroma of sweet pumpkin pie. That may be partially because it was the first pumpkin beer I tried many years ago, while attending college in Maine (where Shippyard is brewed). For whatever reason, it holds a special place in my beer universe, which is why I was eager to try a second pumpkin beer from Shipyard: Shipyard Smashed Pumpkin (part of “Pugsley’s Signature Series”). The beer pours a bright orange, slightly cloudy color. The nose consists of faint pumpkin; it’s far more raw pumpkin than pumpkin pie and clean for a beer that boasts a 9% ABV. The flavors are a nice combination of nutmeg, hops, malt, cinnamon, and raw pumpkin. It’s well-balanced considering the high alcohol content. 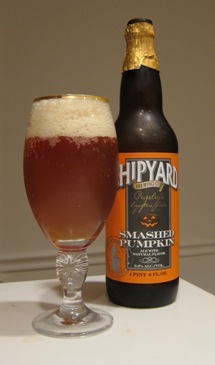 A 22-ounce bomber of the Shipyard Smashed Pumpkin sells for around $10. At that price, I’d rather pick up a six-pack of their Pumpkinhead which, while lower in alcohol, has more pronounced pumpkin pie flavors. Still, this beer is further evidence of my contention that pumpkin beers make for an excellent pairing with a good cigar. For this beer, a mild- or medium-bodied smoke goes great. I’d suggest the La Gloria Cubana Retro Especiale or the Alec Bradley Family Blend. We’ve now looked at eight different pumpkin beers, but there are countless others. Let us know your favorites to pair with a cigar in the comments. My favorite is probably the Southern Tier Imperial Pumking. I also like the pumpkin beer that's available at Sweetwater Tavern locations. For any of these beers, dip the rim of your glass in orange juice and then crushed graham cracker before pouring your beer. The result is kickass.